Keep Zoho CRM Home Page Clutter-free - For Yourself and Your Team. The home page of Zoho CRM is very crucial for most of us. It is where you organize your day's work - your way! A cluttered home page could leave you lost in a busy schedule affecting your productivity. And the same holds true for anyone who uses Zoho CRM - be it for sales or marketing or any purpose. This tip will focus on how you can maintain a clean and clutter-free Zoho CRM Home page, for yourself and for your team. Views help you to look at just those key components of your business that matter to you most in the Home page. The Zoho CRM Home tab comes with three types of views - Classic View, User's Home Page and Customized Home Page. 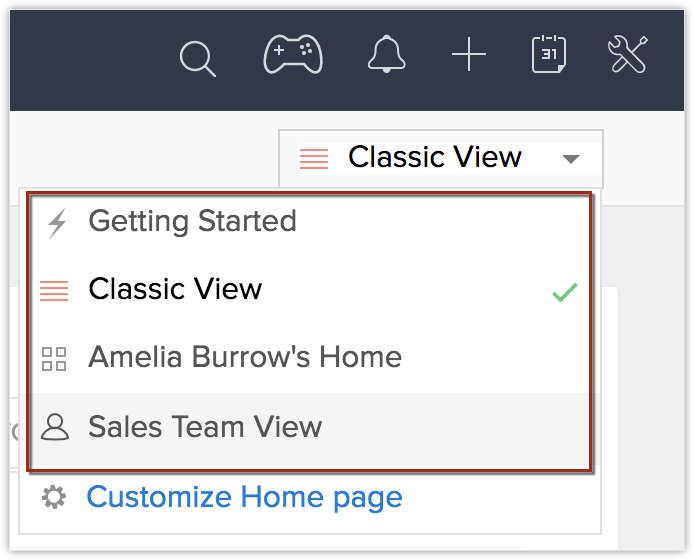 The Classic view lists three standard components that include Tasks List View, Today's Events and Pipeline by Stage by default for all users. You can take advantage of the User's Home page to customize the home page and keep only components that you wish to look at, for yourself. Let's say you are the Regional Sales Head for South, you might want to pay more attention to things like Regional Sales Pipeline or Key Accounts for your Region. Or if you happen to be a marketer, it would make more sense to have components based on Email Analytics or Google AdWords like Most Performing Keywords or Potentials by Google Campaign.. Using Customized Home Page, you can create and share a common View across roles based on what you want them to see. For example, you can create and share a View for all your Sales reps to include components that you want them to see on the daily basis. Organizing Tabs to display only the modules that matter to you not only keeps your home page clean, but also helps you navigate easily inside Zoho CRM. Imagine having to click the More button next to the tabs, each time you want to get into a module. Frustrating right? What you can do instead is hide all the modules that are unwanted and keep just the relevant ones. For instance, a Non-Profit Organization might not need modules like Quotes and Sales Orders. You can have them hidden and also customize the order of these modules in which they appear. What's more? You can also have this done for your teams using what we call "Tab groups". 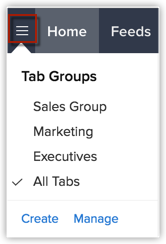 You can simply create a Tab group, include tabs that are required and share it with certain profiles as needed. For instance, the Sales group may use only the Leads, Contacts, Accounts, Deals, Reports and Dashboards tabs. So you can create a Sales Tabs group and provide access only to the Sales profile.